The Straw Chair, first performed in 1988, is in many ways a strangely beguiling combination of contrasting elements: characters, cultures, identities and beliefs, things earthy and ethereal. At its heart is the incredible but true story of Lady Rachel Grange, declared mad, abducted and banished by her ruthless husband to the remotest place he could find: St Kilda (Hiort or Hirta in Gaelic), a rugged but spectacularly beautiful island (or archipelago to be more exact) some forty miles north-west of Uist. Woven into the tragic story of Lady Grange is the tale of a newly married couple who have just arrived on the island one summer in the 1730s: the seventeen-year-old Isabel and her much older husband, the ‘stickit’ minister Aneas Seton, who has been sent as missionary to the island by the Society for the Propagation of Christian Knowledge. The island has been without a minister for some time and apparently still adhering to many of its pagan customs and superstitions. Plays about characters finding themselves on strange islands inevitably invite comparisons with Shakespeare’s The Tempest, and though the echoes in this case are fairly distant, they are discernible. While St. Kilda / Hirta is a kind of enchanted isle that has a transformational effect, it remains a personal hell for Lady Rachel Grange. Like Prospero, she has been betrayed and banished, losing all her previous power and status, but unlike him she has no powers of magic and there are no sprites to liberate her. Unlike the sophisticated Edinburgh society Lady Grange has been banished from (and unlike those of Prospero’s island), the inhabitants of Hirta live harmoniously with each other and their environment. Throughout the play these two societies are constantly set in juxtaposition, providing many sharply contrasting perspectives on each other, but the comparison is not simply historical: Glover clearly implies that the contrast is really an existential comparison of two very different cultures that addresses some of our fundamental issues as a species. How is the island of Hirta presented in the play, how crucial a role does it play in the drama, and how does it affect the lives of the central characters? I’ll try to answer these questions by concentrating on the relationship between Isabel and Aneas and examine the profound effect the strange island, and even stranger Lady Grange, have on them. Firstly some historical facts: Lady Rachel Grange, then in her early fifties, was abducted and exiled to St Kilda, probably because her husband, James Erskine, Lord Grange (brother of John Erskine, the Earl of Mar who led the Jacobite rising of 1715) feared that his wife, enraged by his infidelities, would reveal his political double-dealing. When the play opens, Lady Rachel is being detained on the island against her will in the care of a Gaelic-speaking islander, Oona. By contrast, we learn of Isabel and Aneas’s very different reasons for coming to the island. He is a missionary, coming to do ‘God’s work’, or rather the work of the SPCK, whose authoritarian aim is ‘to catechise the natives and lead them to salvation’; she is doing her duty in support of her husband, but also naively thinking it would be ‘an adventure’, never having left Edinburgh where she lived a very sheltered life. We soon see that she is filled with dismay at the bleakness of the place and despairs about coping with the inhabitants, especially the ‘mad’ Lady Rachel. Isabel prays to God to deliver her home safely to Edinburgh as ‘speedily as possible’. But while Isabel is stunned and frightened by her meeting with Rachel, we hear in the second scene how Aneas has had ‘an invigorating morning’: ‘I have never seen such a place.’ His description of being on top of Conachair shows that he has not just been climbing a hill, but almost been in heaven looking down on creation and is in fact ‘lost in wonder’, which reveals that, although he appears to be a rigidly self-righteous ‘little minister’, he is also surprisingly open to new experiences and new perspectives. Meanwhile, Isabel is ‘brooding’ over ‘Hirta and its highest born inhabitant’, and suddenly starts asking Aneas about Edinburgh ‘oyster cellars’ (which Rachel and other high-society ladies enjoyed) — he is understandably ‘perplexed by the change of subjects’. Here we imaginatively plunge from the cliffs of Hirta to the cellars of a sophisticated city, from the heights to the depths — aspects of the city’s life the innocent Isabel knows little or nothing about. But in spite of being disturbed by Rachel, Isabel grows increasingly anxious to do what she can to help her, and this angers Aneas greatly — the matter at hand is the risky business of smuggling her letter to her friends on the mainland. In fact the judgemental Aneas sees Rachel as a ‘godless, mischievous, evil creature’ and ‘a strumpet’ who is a wicked influence on his young wife and even thinks that her exile on Hirta may be a ‘gentle Bedlam’ as opposed to being locked up in a city madhouse. By Act One Scene Four, this tension rises to the surface in a ‘bedroom’ quarrel, after which Isabel insists on keeping the lamp lit, a small but highly significant act of defiance against Aneas’s authority. Yet the light imagery also links to an underlying conflict between deeply embedded mythologies and beliefs: an authoritarian male religion suppressing older female deities. When Isabel starts fantasising about becoming a scaly snake (suggested by the islanders’ belief that God created man with scales) we might be inclined to think about Judaic-Christian mythology of the serpent in the Garden of Eden and, since Aneas, like Adam, is asleep, Rachel’s sudden appearance at this point could be seen as the devil appearing to tempt Eve with knowledge of the forbidden fruit. However, in Celtic mythology, the snake is linked to ancient wisdom and fertility and as Isabel imagines herself and Aneas swimming together in the sea like snakes, we sense something vibrant and transformational, primordial and procreative stirring in her, while Aneas goes on sleeping in his stone bed, symbolising the sterility in a marriage that has not yet been consummated. At this point Isabel sees the light, both metaphorically and literally, as by the end of the scene dawn has broken and they see the ship on the horizon bringing MacLeod’s steward who will officiate over multiple wedding celebrations — a symbol of the stability, happiness, and joyful tenacity of life on the island. Indeed, by Act Two we can see the island’s effect on Isabel quite dramatically: wearing island clothes, waving her shawl above her head, singing and dancing barefoot as she enters into the spirit of the island’s celebration of nine marriages at once — a highly propitious number. Even Aneas seems to be thawing out as he too enters into the spirit of things and later confesses to being moved and indeed stirred by the sight of the young island women dancing. Yet Isabel’s growing sympathy for the ‘mad’ woman still generates ‘a great gulf’ between the couple. Rachel’s increasingly desperate attempts to smuggle a letter to the mainland leave Isabel with a real dilemma: wanting to help Rachel but having to defy or even deceive her husband by doing something that could have dangerous consequences for all of them. Rachel gradually exerts her charm on both Isabel and Oona, and, in the longest scene in the play, cajoles them into sharing a stolen bottle of brandy (belonging to the steward). Overcoming social barriers, they share stories, sorrows and laughter, and Isabel and Rachel quarrel and even fight with each other (literally and metaphorically) over the straw chair. It is a boozy bonding session that throws up quite a few surprises and also signifies Isabel’s growing self-assertiveness and spirit of rebellion. It’s a long way down! You’ll never make it! By God but you might! Although Aneas initially feels betrayed by her departure, he has been on a transformative personal journey himself, and perhaps now understands the truth of Isabel’s claim that ‘the islanders will pray and praise till dawn whether there is a minister or no’. He is no longer angry with Isabel, but filled with relief and gratitude that she has returned safely, even though Lord McLeod’s steward has now arrived and discovered the letter. They will be immediately sent back to Edinburgh in disgrace, but in spite of the consequences he now feels that Isabel was ‘right’ though ‘misguided’ to send the letter, and that she has in fact ‘done … far less wrong’ than he has. In addition he will do what he can on Rachel’s behalf when he returns to Edinburgh, even though they are but ‘small folk’ in comparison with the great lords who ‘prowl and prosper’, like powerful predatory cats. Instead of Aneas changing Hirta for the better, as he saw his duty at the start, both he and his wife gradually fall under its spell and by the end, the island and its people have changed them both in a profoundly positive way. As in Prospero’s Isle, where characters ‘find themselves’ or are ‘reborn’ in some way, Isabel and Aneas both attain a new sense of identity and integrity through making difficult personal or moral choices. You were always bonny […] But I could not find the words — till I came to Hirta. On one hand, the mood of the ending is partly one of cautious affirmation as two people discover the life-enhancing power of genuine, enduring love as a result of their time on this ‘primitive’ society where women play an equal part with men. Yet the minister and his ‘beloved wife’ will suffer from trying to help Rachel (as the real minister, Roderick MacLennan, in fact did) and their future is at the mercy of forces beyond their control, while Rachel is left on her rocky prison, broken in spirit and suffering greatly. And while Rachel will be treated kindly by Oona, the islanders will probably still see her as some kind of fearful alien presence. Most of their superstitions appear benign, but Lady Rachel is likened by them to the hated skua, (a bird of ill omen as it robs the gannet’s nests) not just because she appears deranged but because she represents something demonic from an outside world which brings dangers and evils from afar. The central symbol in the play, and the main prop out of the few used, is the straw chair which Rachel clings to as a pathetic symbol of her former status — it is, in effect, a vain symbol of the social hierarchy from which she has been banished and which has no relevance here, just like the tattered Edinburgh gown she wears to try and impress her visitors. Rachel also likes to boast of her grand Edinburgh house full of expensive chairs, especially Lord Grange’s chair which contained a hidden drawer for his secret letters and which, like Rachel’s letters with their ‘black marks’, symbolise the deceit and darkness of a sophisticated but corrupt Edinburgh hierarchy in contrast to the self-organising, egalitarian community of Hirta. Unfortunately for Lady Rachel, there is no Prospero or Ariel on Hirta, but the island has no brutes either — the brutes responsible for Rachel’s cruel treatment reside on the distant mainland. There is also no return to her rightful place, no reconciliation or redemption and no happy ending. Unlike Prospero, Rachel does not have a loving daughter with her. But she is treated with great kindness and compassion by her devoted custodian, Oona, who does indeed possess a kind of intuitive human magic born of the island itself. But sadly this is something Rachel Grange cannot respond to as she is still a prisoner, her wounds are beyond healing and her suffering not yet ended. In addition to the cultural contrasts highlighted by the various characters’ backgrounds and expectations, The Straw Chair also suggests broader existential questions about the nature of humanity, the roots of human goodness and evil, and the sources of true love and happiness. Hirta, like Prospero’s island, is an enchanted place which generates a sense of awe about the wonders of creation, but it is not entirely romanticised — we are fully aware of its hardships, and while Rachel’s perspective is unreliable, it does serve to highlight some of the island’s shortcomings for those who might dream of the idyllic island life. 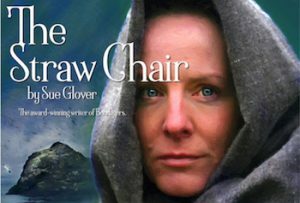 The Straw Chair, like several of Glover’s plays, explores Scottish history from a female perspective, giving voice to exploited or alienated women whose identity has been determined by their role or their status in a hypocritical patriarchal society. The endings may be dark or at least ambivalent, but we also find a cautious optimism, especially in the way Glover portrays women gaining strength and wisdom from each other, and in the way she celebrates the positive bonds of human love, compassion, community and interdependency that are essential to our survival and progress as a species.